I’m behind times and I thought I’d put up a quick post about my current quilt. But I ended up with a ton and nothing to do with them. So I put them in a box as usual (I can’t seem to throw anything that I’ve worked on as long as these blocks away.) They probably would have been donated to my Guild or made into a charity quilt. I still have to track down the maker of the quilt I drew the inspiration from. Stupidly, I saved the picture without any attribution. Should have just put it in Pinterest. And darned of those blocks aren’t a 9-patch, the corners of which are my Kansas Dugout Blocks. So, of course, I dragged this out to work on when I finished In Full Bloom but still had a week or so of Making out with BoB. A Tribute to Mary Ellen Hopkins? 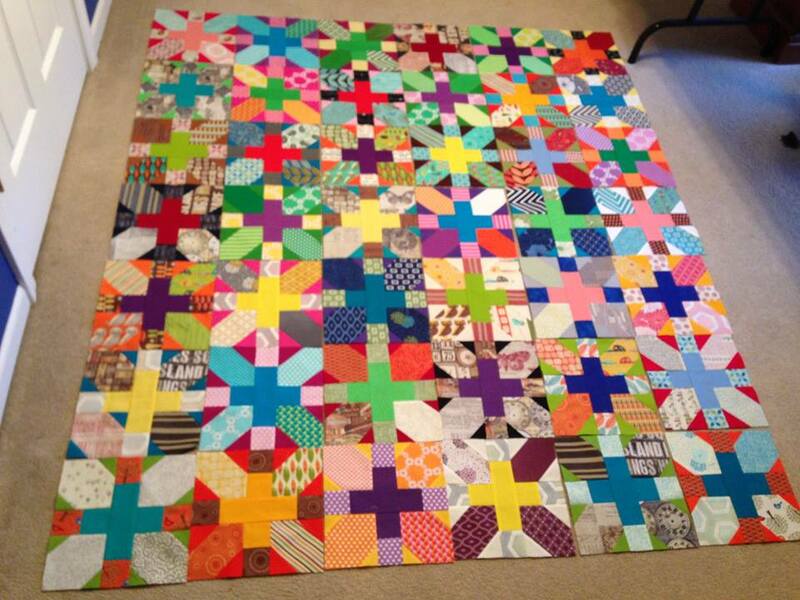 Just 1 row of 8 blocks to go until I move everything around and then sew it together. 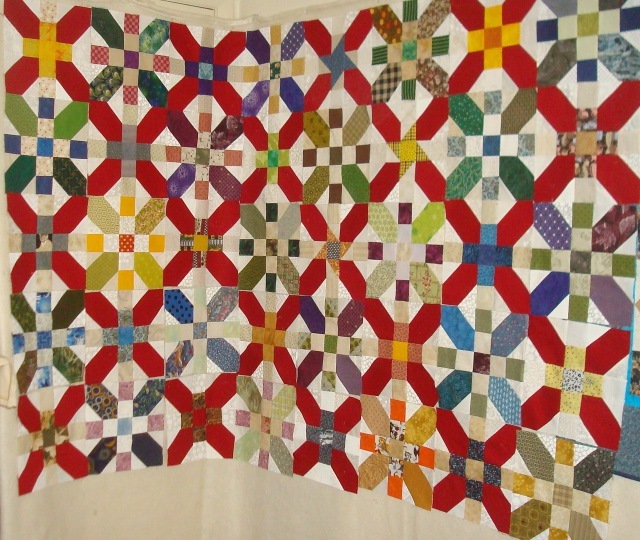 I realised what had made my original tribute quilt so static was that the red blocks overwhelmed the rest, so I took some leftover Dugout Blocks which had been the leaves of In Full Bloom‘s outer pieced border (I’ve been having trouble with math lately…) and mixed them. I liked what I saw, so I just made more with fabric from my scrap box. I like the way the wild scraps calm and are calmed by those red Kansas Dugout blocks. 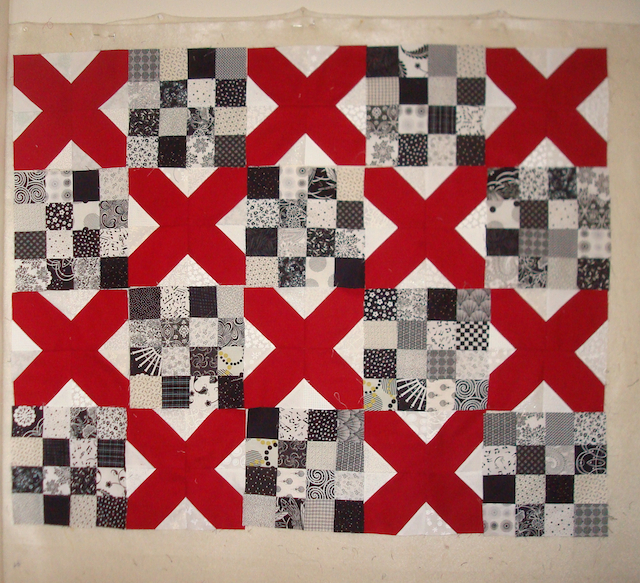 I changed the centers so that the red ones had dark fabric next to the centers and the non-red ones had light. 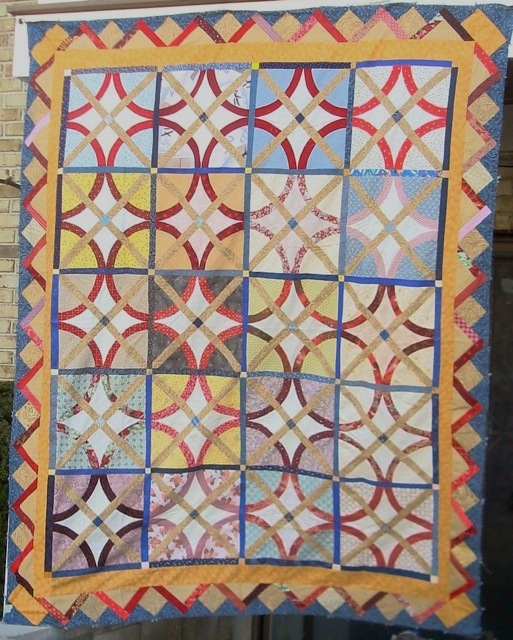 But, really, it’s a traditional block called “Spool” by Nancy Cabot. Les Filles Des Mares is not done. It needs at least a border, possibly two. So I strung a cord (in this case a decorative cord that I had from my brief flirtation making quilted purses) and pinned the tops to it. Worked great now that I figured out to pin right next to the hooks and half-way between them. I also needed to tighten the cord a bit, too, but that was easy since the ends were held in place with binder clips. And, of course, the wind was a problem, but that was true of the former method of putting the quilt and tops up for photographing. Anyway, here’s the “big shots” of the quilts I have been working on for the past couple of months. 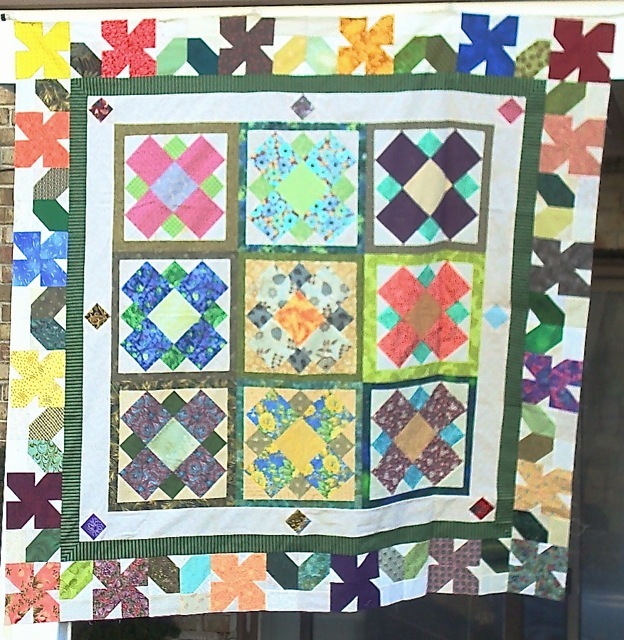 In Full Bloom was my Linten Challenge BoB project. It’s only 62″ square, but I’ve been told that that’s “big enough. Yay! Done. Crossed Purposes in all it’s glory. I’m actually happy with the way it turned out and I think that border is the reason for that. 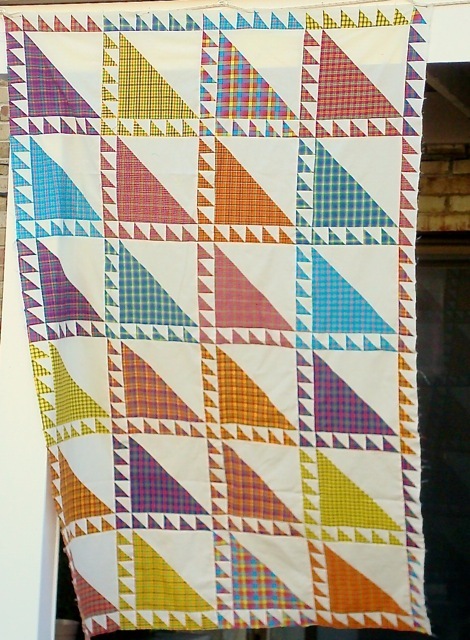 Still Searching for a name for this quilt. It’s the one I had originally started in tribute to Maryellen Hopkins, but then pulled the Dugout blocks out because they were the “wrong” color of red… Hmmm. 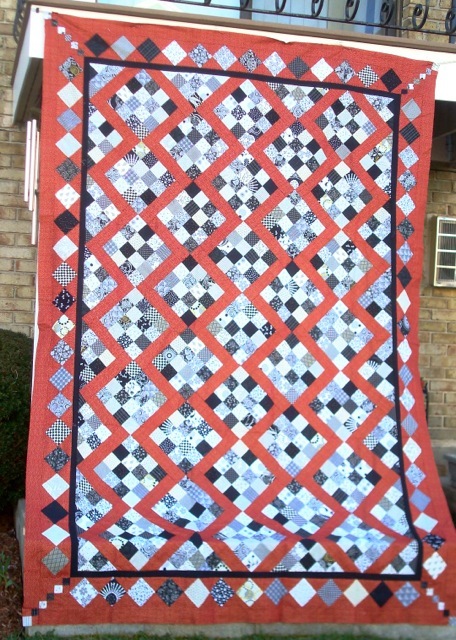 That sounds like a good name for a quilt The Wrong Color of Red! 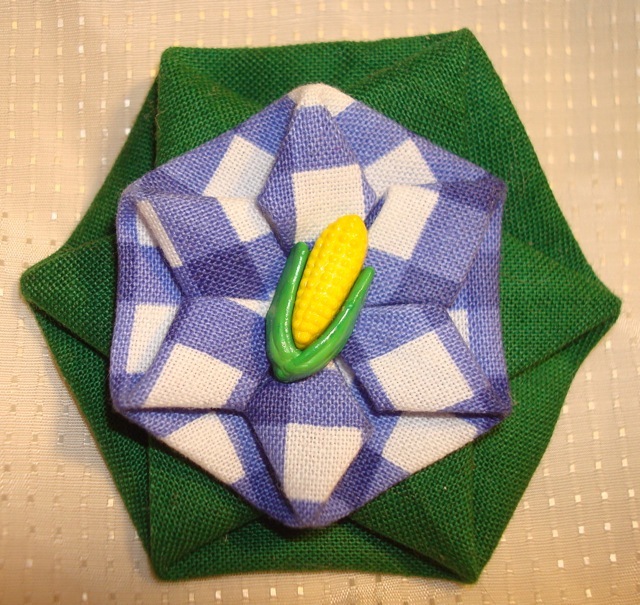 My folded flower pins and hair clips are now available at the New England Quilter’s Museum… in case you really need one. I have to chuckle that I named the last post “No Show” and then missed blogging last week because of trouble with my ISP. I swear it was not on purpose! I had been working on my taxes and the “computer” had been slow, I only got the Fed filed when my Mac stopped being able to load anything at all in my browser. Naturally, I thought it was me and my machine, but it turned out to be my DSL connection and after many hours of testing, plugging and unplugging, trading wires, turning things off and on, etc. I still ended up having to wait for someone to come on Monday. And, yes, it’s Saturday and not Thursday because I was supposed to shoot all my quilts on Thursday and then blog, but I ended up with a migraine… which lasted until today. Now we are all caught up. There are 8 more days if you are playing the Linten Challenge with BoB. I finished In Full Bloom as a top (which counts for me.) I was trying to decide if I wanted to try to complete another BoB before Easter, but dithered for most of last week. 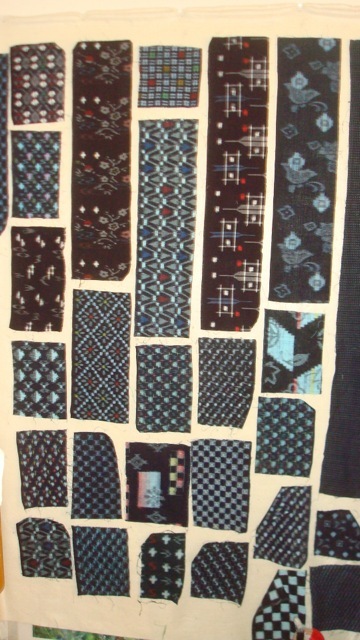 These are the indigo fabrics after washing. I think the contrast is a bit greater. Instead, I went through my jewelry, cooking and quilt magazines and decimated them. (Well, I kept much less than 90%, so maybe I should use some other word.) In fact, I threw so much paper and clutter away that I was astounded that more space wasn’t clear afterwards. I guess that’s why I ended up with a migraine. Anyway, one of the quilty things I did do was wash the Japanese indigo fabrics my friend Addie gave me. If you remember, I had considered using them all in a quilt and calling it Mood Indigo, so I did some research on them. I knew they were Japanese and indigos. 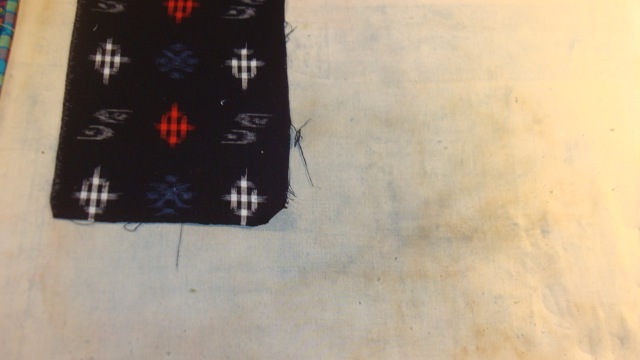 I suspected they were Ikat, but I was really surprised to find out that they were made by a process called kasuri. It turns out that kasuri fabrics are yarn dyed (usually in a process like tie dying) and then woven in plain weave to produce the patterns. For me, it makes the patterns in these pieces even more interesting. Most are geometric, but one has birds in it! So cool. Now, I’m wondering how I can bear to trim them! A big problem with these indigos, though is that they bleed. After washing 4 times with Synthropol, my indigo fabrics are still running… how will I ever catch them? They are also stiff. I read somewhere that I should wash them with hair conditioner to soften them, but I’m going to go on with them as is. 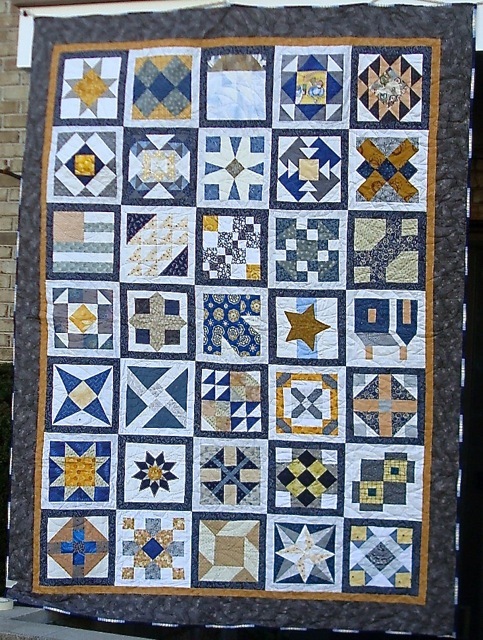 After all, jeans loosen up the more you use them, so maybe the subsequent quilt also will. 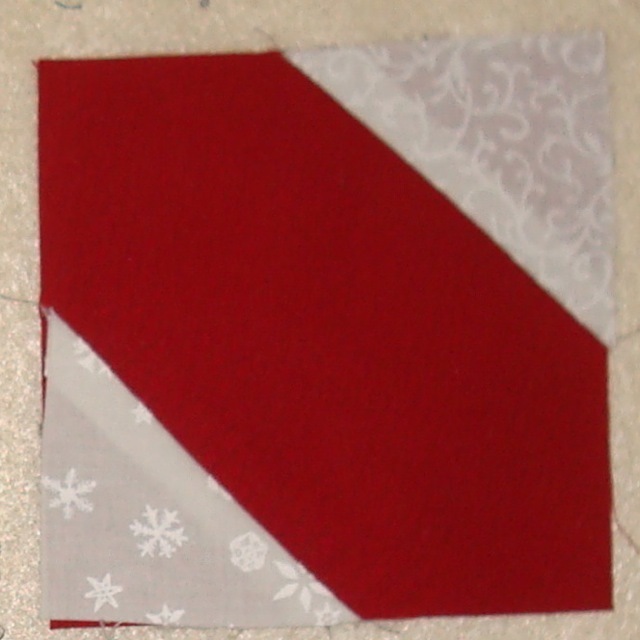 I also have decided not to use white or off-white in the quilt in case the dye is still running. I figure not using very light fabrics should make the kasuri patterns stand out more. Right? Anyway, I’m off to the farmer’s market this morning (what there is left of it.) I hope you’ve all been well the last couple of weeks. I’ll try to get those quilts photographed this week! Oh, and special congrats to my friend Jeff Lomicka for winning a second place ribbon at MQX in Manchester. Jeff and his wife, Cricket are the ones who lend me time on their long arm. Go Jeff!